Newly sworn-in Illinois Gov. J.B. Pritzker sees the state as one of possibility and promise, and outlined how he plans to fix a variety of issues during his inauguration speech last Monday. “No. Everything is not broken,” he said in his speech. Pritzker, who beat out the former Republican Gov. Bruce Rauner 54 percent to 39 percent in November, touched on many of his priorities and ambitions during his inaugural ceremony. The governor was also clear in mentioning his prospects of bettering higher education, reassigning the minimum wage to $15 an hour, joining the U.S. Climate Alliance, creating measures to improve the criminal justice system as well as legalizing recreational marijuana in the state. Throughout his campaign, Pritzker has made college students a top priority. His plans for higher education in Illinois include a 50 percent increase, or $200 million in financial aid, for low-income college students through the Monetary Award Program. However, an increase in MAP grant funding to $200 million isn’t that impactful. The University of Illinois school system has an annual budget of $6.5 billion. This would mean the MAP grant would add only an additional 3 percent towards that budget. The MAP grants could in turn reduce the cost of student loan payments. To continue to deliver on his promises from the election, Pritzker also hopes to materialize a state-run student loan refinancing program to further aid low-income students debt. It didn’t take Pritzker too long during his inaugural speech to address one of his most heavily supported campaign issues of legalizing recreational marijuana. “In the interests of keeping the public safe from harm, expanding true justice in our criminal justice system, and advancing economic inclusion, I will work with the legislature to legalize, tax and regulate the sale of recreational cannabis in Illinois,” he said. Pritzker during the general election vowed to end marijuana prohibition in the state “right away” and is focused on the tax revenue the state so desperately needs. Analysis from the Illinois economic Policy Institute shows the state would rake in more than $500 million in tax revenue. Subsequently, this would inject about $1 billion into the state’s economy by 2020. Not only will the state have another area of revenue, but the creation of an additional 24,000 jobs are also projected. For the individuals who were convicted of marijuana related crimes previously, Pritzker said he will look at vacating those arrest records. Much to the despair of the American people and rest of the world, early in his tenure President Trump announced his withdrawal from the Paris Climate Accord. 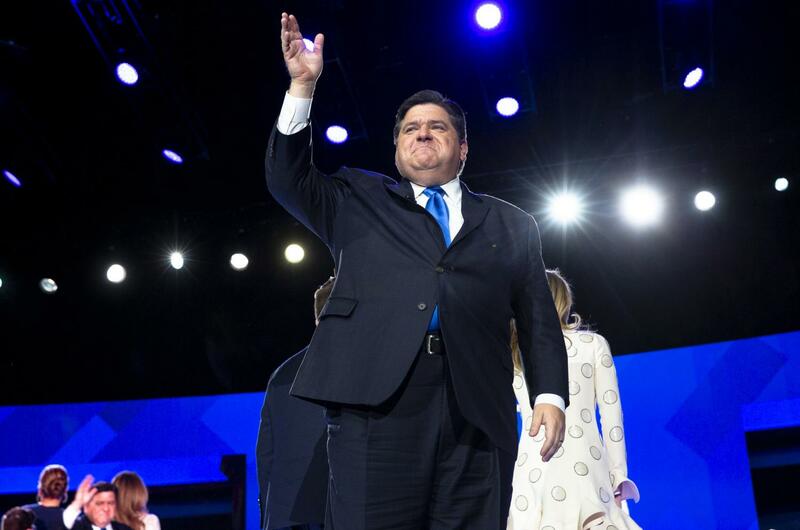 Much to the excitement of Pritzker and environmental supporters, Pritzker said, “As one of my first acts as Governor, Illinois will become a member of the U.S. Climate Alliance, upholding the goals and ideals of the Paris Climate Accord. “It speaks volumes that almost all the nations in the world were able to reach a consensus on a single topic. Even though our president doesn’t see the extremity of the situation, at least our governor is trying to better future generations,” said DePaul environmental studies major Carolyn Brinckwirth. With Rauner in the audience, the new governor was keen to portray himself as the antithesis of Rauner during his term. Pritzker vowed for productiveness and cooperation with the state Republicans. Willingness to enter discussions on the state’s budget and tax system are welcomed by the new governor. However, “if you lead with partisanship and scare tactics you will be met with considerable political will,” he said. Some of his most notable calls to action came throughout the campaign and was highlighted again during his speech. The implementation of a fair and progressive tax plan and creating a balanced budget is an issue he will be heavily focused on in his tenure. The graduated tax plan that Pritzker proposed during the elections still has not been further revealed. His plan would replace Illinois’ current flat income tax rate of 4.95 percent. Instead, individuals with higher incomes will have higher rates and those with lower taxable incomes will have lower rates, a strategy used by 33 states and the federal government. Chicago politics expert and DePaul lecturer John McCarron said he is less concerned with “the good stuff” and more focused on “all the red ink and unfunded pension liabilities.” McCarron said he would rather see the graduated income tax, which would then require a constitutional amendment. The ‘Blue Wave’ that swept through the 2018 general elections hit home for Illinois, with Pritzker and House Speaker Mike Madigan now having full Democratic control of Illinois. “The Speaker and the new governor can indeed push their agendas freely, having secured veto-proof majorities and the governor’s mansion,” McCarron said. general assembly, Pritzker should have no trouble working hand in hand with his fellow DNC members.